Coriander greens are known as Kothimeera in Telugu and Hara Dhaniya in Hindi. This is one of the mostly used leafy vegetable, besides Curry leaves in India. 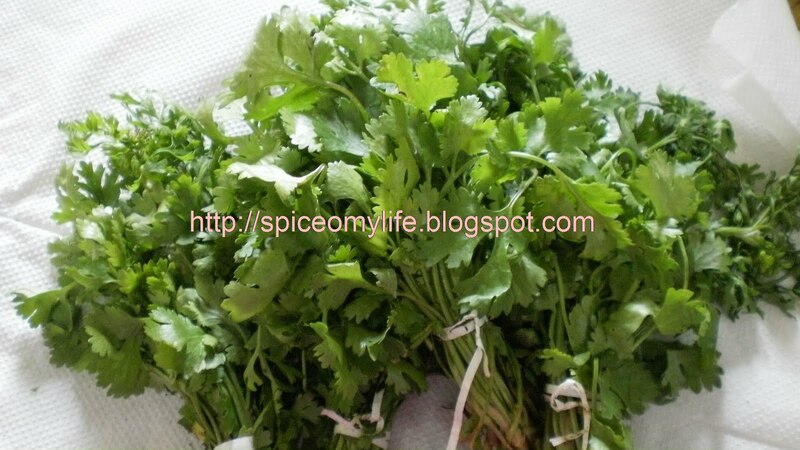 This is also know as Chinese Parsley or Cilantro. This is an annual as well as perennial herb and produces the Coriander seeds. Though all parts of the plant are edible, leaves and seeds are mostly used. In India the leaves are used to garnish and also as an ingredient in the curries, soups, chutneys sauces and many other dishes. Apart from that, the leaves are used to make chutney and other dishes. Coriander seeds are known as Dhaniyaalu in Telugu and Dhania in Hindi. These seeds are used in many of the Indian dishes as a whole but mostly in powder form, in curry powders and other dishes. Coriander has got medicinal properties. It is high in A, B1, B2, C and Iron. The leaves act as stimulant and tonic. Strengthens digestion, digestive system especially stomach, relieves flatulence. Excellent skin tonic. Fersh juice of coriander leaves mixed with turmeric and applied on face every night before going to bed, helps in reducing pimples. Juice of fresh coriander leaves, a pinch of turmeric and some curd mixed together and applied on face, neck and hands for an hour and then washed off with a mild soap or chickpea flour, gives you a glowing and clear skin.